Detail : Paul's second solo single. 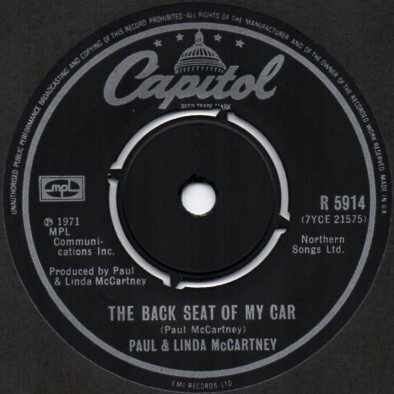 Credited to "Paul and Linda McCartney"
Associate musicians featuring : Paul, Linda, Denny Seiwell, Dave Spinozza and Hugh McCracken. Easily the best song on the "Ram" album, the track was selected for single release, but performed badly in the chart. The poor performance could have been down to Apple releases now being co-ordinated from American offices, with the UK arm all but ceased trading. This release was just about exclusive to Britain. In America "Uncle Albert" was selected as a single, and in most of Europe it was "Eat At Home". On the standard Apple label, the single did NOT appear in a picture cover in the U.K. just a plain black sleeve. As with "Another Day", this later came out on Capitol (as shown above ... ps. I can't find my Apple version, it's up there somewhere ! ).